Warning! (Ha!) Four draft poems below for Corey Rowley’s (Herotomost’s) prompt on With Real Toads to write about a last supper. Please feel free to read one or more! Thanks! when we slip into that night. when we are eaten by that night. and the street lights still as bright. ‘twixt the table and our ribs. Special thanks to all who got to the bottom of this post! 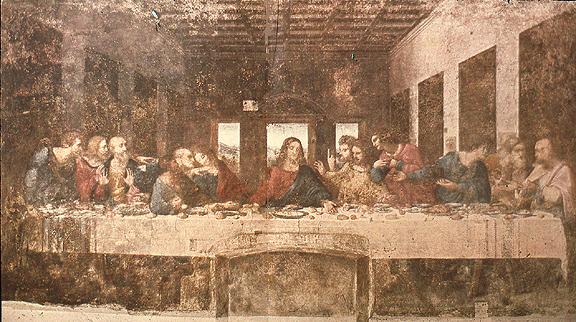 The painting is by Leonardo da Vinci, a fresco of the last supper–this pic, pre-restoration; no copyright intended of photograph whose source is unknown to me. k.
This entry was posted on August 29, 2015 at 8:25 am and is filed under poetry, Uncategorized. You can subscribe via RSS 2.0 feed to this post's comments. Love these k — special poems. Thanks so very much. Many congratulations! k.
This doesn’t sound too bad – to remain part of the cycle of this beloved earth. Such an enjoyable multi-view of the topic. I especially applaud your contemplation of Da Vinci’s Last Supper. It is awe-inspiring. It feels really good to see that someone took to the prompt so completely that they wrote four pieces….lol. After reading all four several times, I can’t pick a favorite because the are all so different in style and substance. I find the last one rings so true, the dying often try to live for the living and not themselves…sad by true and what a great portrayal of that in your words. I really loved the third one “in the style Gordon and Byron” because it did just have that feel. the other reason is I say that to myself all the time after a gluttonous weekend and it does wear off by the time the next weekend rolls around…lol. the second one was a great accompinament to the painting in my mind, it had the feel of the Fresco and the bit of mystery that seems to be part of the fabric of the scene. the first one had the best physiology of all of them. It had a lightness that tipped and tripped along and a smear of rhyme that really lifted the spirit, I cannot believe you got 4 such quality poems out of my food prompt….you are wonderful and so full of life, I love it. Thanks so much, Corey, for responding so thoughtfully to each poem! Obviously, I enjoyed the prompt–I thought about my own last meal–but it was perhaps a bit too personal for me to get into! Thanks again. k.
Ha. Thanks so much for your super kind comment. k.
Made it to the end of your post … for me, you saved the best for last! I especially liked the last two, Karin……the closing one captures how the dying simply cannot eat any more, much as their caregivers want them to “keep up their strength”. What a marvelous way to cover the aspects of the last supper. The last one when a person seem to live on air talked to me especially strong. Somehow the earlier poems seemed to build up to that crescendo of reality. The first is my favorite, and the third cracked me up! Glad I read to bottom and savored all four courses, K! A wonderful excursion through these four pieces. You’ve covered all the stages and ages…and I especially like your delicate reflection on ‘the mural…’ Fine writing! Thanks so much, Steve. They are rather random, but your kind comment is much appreciated. k.